Current guidelines of the Federal Communications Commission (FCC) and similar organizations are outdated and do not adequately protect us from the hazards of radiofrequency radiation (RF). FCC exposure guidelines only protect against thermal damage despite overwhelming evidence that so-called non-thermal effects also occur. These non-thermal effects are simply unregulated. Since the FCC will not adequately protect the public, it is basically up to informed consumers to do the best they can to protect themselves. Reduce or stop the use of cell phones. Reserve them for emergencies or other essential uses. Replace cordless telephones with corded telephones. Establish wired (Ethernet) interconnections between routers and the wireless devices that the routers support. Then turn off the wireless capabilities, such as Wi-Fi and Bluetooth, of them all. ‘Opt out’ of the wireless smart meter on your residence, if your state or local electric power company permits. Many states, but not all, have an opt-out provision. “Captured Agency: How the Federal Communications Commission Is Dominated by the Industries It Presumably Regulates,” by Alster, Norm; Cambridge, MA; Edmund J. Safra Center for Ethics, Harvard University (2015). PDF document available at: PDF: http://bit.ly/FCCcaptured. Also see https://smartgridawareness.org/2015/06/27/fcc-prime-example-of-institutional-corruption/. “The Health Argument against Cell Phones and Cell Towers,” by Ronald M. Powell, Ph.D., August 26, 2016; full document available at: https://www.scribd.com/document/320935636/The-Health-Argument-against-Cell-Phones-and-Cell-Towers; also see https://www.scribd.com/document/317221965/How-to-Reduce-the-Electromagnetic-Radiation-in-Your-Home. This entry was posted in Smart Grid, Smart Meters, and RF Emissions and tagged Health Effects, RF Emissions. Bookmark the permalink. I sure appreciate this advice. However, I am wondering what to do about this situation: We are at the point where we need to buy new kitchen and laundry appliances. 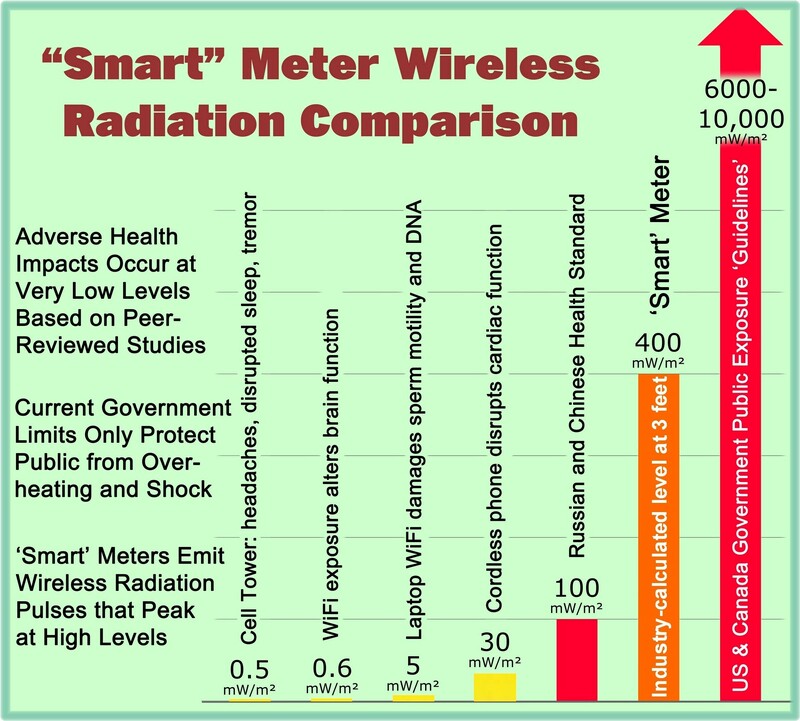 I do not want the kind that emit continuous RF to communicate with the smart meter, although in my case in Naperville, we have a “Non-Wireless Smart Meter Alternative” and I think the RF signal would go directly onto the electrical lines. In any case, do you know if there are appliances available without the embedded, emitting chips? Or, is there a way to disconnect or remove those chips once you own the appliance? Are there service contractors willing to do this type of job? If so, how do I find them? I would say that the so-called smart appliance is still the exception rather than the rule when it comes to buying an appliance. As long as you shop for an appliance that does not have a LCD screen and does not mention something like “smart” or “WiFi enabled”, then you should be safe in terms of being exposed to unnecessary RF emissions. But you need to do your homework and read the specifications for the particular model you are interested to be sure. I think as the public wakes up to this, the manufacturers are going to be forced to make it easy to disable these functions. I already see growing consumer awareness and this is what will drive change.